As with all things in the current climate, coming up with a novel marketing promotion can make all the difference, especially among us golfers. The popularity of Groupon-type offers seems like an easy fall-back and is being widely used... I have my doubts about this route and will address what I see as the pros and cons in a later blog... especially as a Canadian golf blogger (golfgal) has written an article on why they are such a positive option for golf clubs: her article is here. 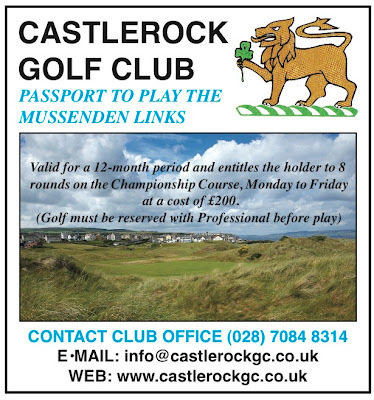 I'm not saying that this brand new Castlerock offer is stunningly different – certainly not along the lines of Druid Glen’s month of free golf (March 2010) – but it demonstrates how golf club’s have started thinking outside the box to reach new audiences and encourage repeat business. The old reliables (€30 green fee with free breakfast/steak lunch; the four for the price of three, the twilight rate) will always be popular, but making an impact by doing something different will grab your audience's attention. The offer from Castlerock does just that. "There aren't many links courses where you can play during the summer for £25 a round," says Mark Steen, Castlerock's Secretary/Manager... diplomatically leaving out the words 'this good' after links courses. Castlerock promises perfect links golf and the night I spent in the bar was one of the most hospitable I spent during my travels. "Lots of golfers have asked us about a summer golf pass, but we decided to cover the whole year and see how well the offer is received," Mark continues. This offer will be attractive to any golfer who decides to descend on this stretch of heavenly links coastline. The deal is this: you pay £200. In return you will be sent a booklet with 8 green fees, valid for one year. These can be used between Monday and Friday at ANY TIME OF THE YEAR (subject to availability, obviously). That's it. You phone the Pro shop, you book your tee time, you play your golf. Castlerock is a Northern Ireland links gem with all the quality, views and links bedevilment you could hope for. The club sits on the western edge of one of the most stunning stretches of links courses in the world (Portstewart and Royal Portrush are practically next door). The Irish Open is coming this way so you could head up over the summer and play the brilliant Castlerock and then enjoy Royal Portrush's Irish Open course in probably the best condition of its life. Who knows, ask nicely and you might be able to bring a friend and use two tickets at once. Yes, it's £25 per round. And, considering the benign weather, here’s one final thought: Castlerock has an excellent (winter) offer on the go at the moment - £100 for a fourball, with a fry-up. The offer has generated £3,000 in green fees so far and it runs until the end of March. When the club added in the fry-up there was a huge increase in interest, showing quite clearly how health conscious we are and what we like to think about after a blustery day on a wonderful links. Check out their website and give them a call.